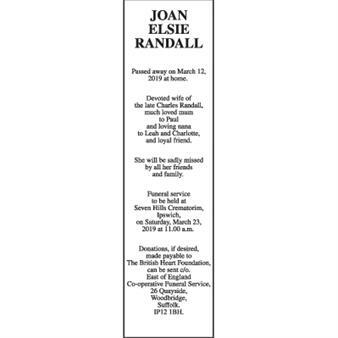 Originally printed on March 16, 2019 in the East Anglian Daily Times. 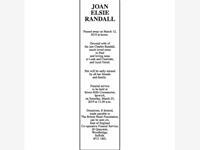 JOAN ELSIE RANDALL Passed away on March 12, 2019 at home. Devoted wife of the late Charles Randall, much loved mum to Paul and loving nana to Leah and Charlotte, and loyal friend. She will be sadly missed by all her friends and family. Funeral service to be held at Seven Hills Crematorim, Ipswich, on Saturday, March 23, 2019 at 11.00 a.m. Donations, if desired, made payable to The British Heart Foundation, can be sent c/o. East of England Co-operative Funeral Service, 26 Quayside, Woodbridge, Suffolk. IP12 1BH.